I enjoy Maison du Chocolat chocolates so much I often travel to the store to buy some. I was lucky enough to be invited along to the Christmas launch and we got to try a number of their chocolates as well as getting a goodie bag which included a Christmas Star made of chocolate with delicious nuts inside. 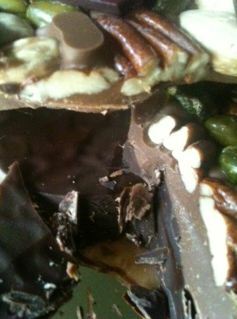 I treated this delicately until I cut into it and realised it was a thick slab of chocolate. 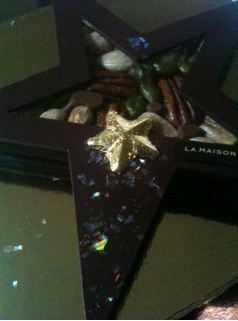 The star on top is delicate but the nuts are in thick and delicious milk chocolate. The base is a thinner slab of dark chocolate but it is still thick. Regular readers will know of my reluctance to eat chocolate with fruit and nuts in it but also how high quality chocolate has swayed me. This milk chocolate is sweet but not too sweet and the thick layer of nuts is deliciously perfect. There are whole pistachios, pecans and other delicious nuts help balance the sweet milk chocolate plus the dark chocolate base eaten with the milk chocolate makes for a delightful combination. The star is absolutely beautiful. What an amazing and beautiful gift! Husband also tucked in to the chocolate with me and ate most of the base while I was enjoying the milky chocolate with nuts and the delicate and thin dark chocolate star outline on top. While not inexpensive, there is a lot of chocolate in this piece and quality nuts so I’d say that overall it is worth investing in as a gift.